I have been fortunate to catch "9 permit" while fly fishing. 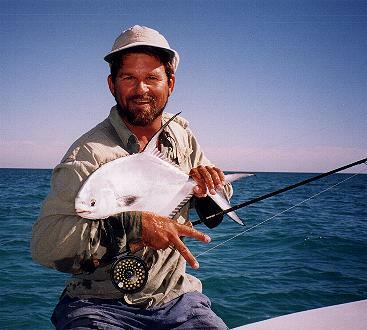 "5 permit" I caught fly fishing right here in "Islamorada" - let's get some more photos up in here! 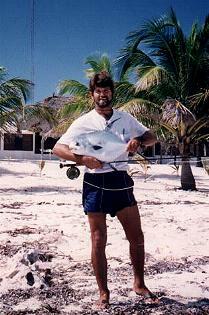 while I managed a fishing lodge there for a season. 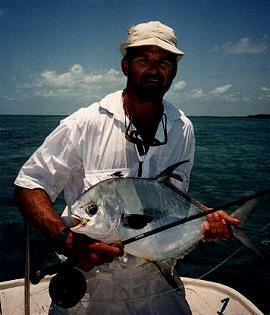 I can guide you to your dream "permit on fly rod" right here in Islamorada - The "Holy Grail" of saltwater fly fishing! 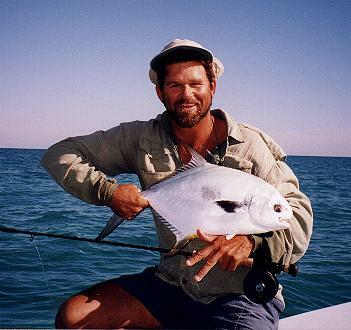 Three permit while fly fishing !!! My first cast of the year (after returning from 2 months of surfing in Costa Rica), I hooked this permit which was one of a pair. It weighed 14-lbs. Once I got it to the boat, I knew this was a good omen for the year, but I had no idea I would catch another two that afternoon. 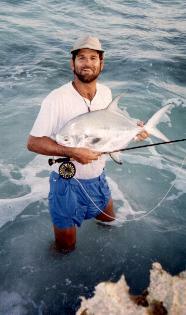 The second permit on fly rod that afternoon. It only weighed 4-lbs, but still a permit. I was fishing with my wife. We had returned to the area I had been fishing that morning with a client on a half-day trip. That morning we had seen maybe 200 permit. That afternoon we saw about 250 permit. The third permit on fly rod that afternoon, 9-lbs. (weighed). 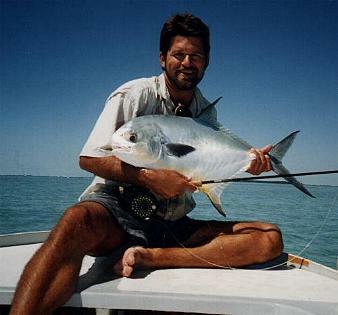 It is also my "ninth permit on fly". I like to think I could have caught more, but the sun was getting too low and I could not see the fish. There is always that next "nut to bust." My sixth permit on fly. It weighed 17 lbs. and was released. 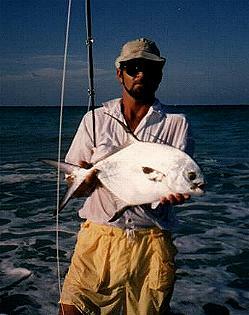 This was the second permit on fly I caught in the keys. My first permit on fly (est. +15 lbs. 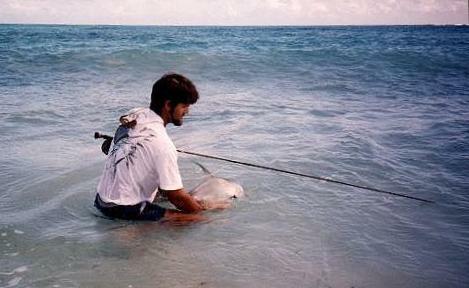 ), caught from the shore at Ascension Bay, Mexico. 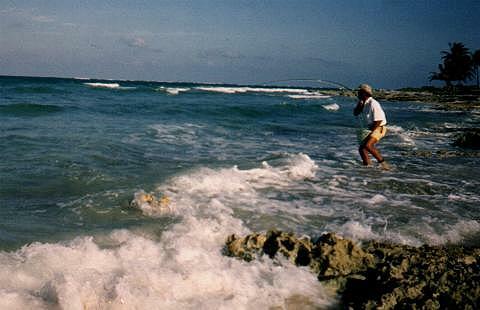 It was tailing along the shore and rocks. My wife and I managed the lodge down there for one season. Fourth permit fly fishing (est. +17 lbs.) in Ascension Bay caught with Ted Johnston. We were fishing by ourselves. 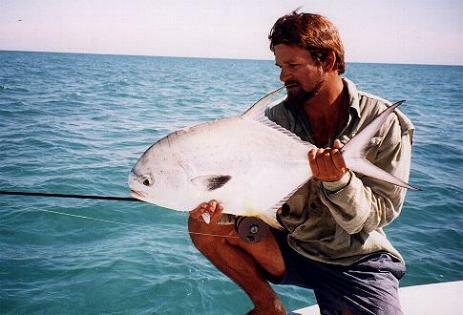 Releasing my second permit on fly rod (est. 12 lbs.). My second permit fly fishing, about 12 lbs., caught right in front of the lodge while all the clients were out looking for them an hour or so away. Striking hard with 10 weight SAGE RPLX against the third permit on fly.